Below are some samples of statements made by our previous scholarship winners! Click here to view Roseanna Lawandi’s thank you letter. I would like to thank every member of DAAF for his/her generosity and contributions to the DAAF scholarship fund with the University of Dayton. . 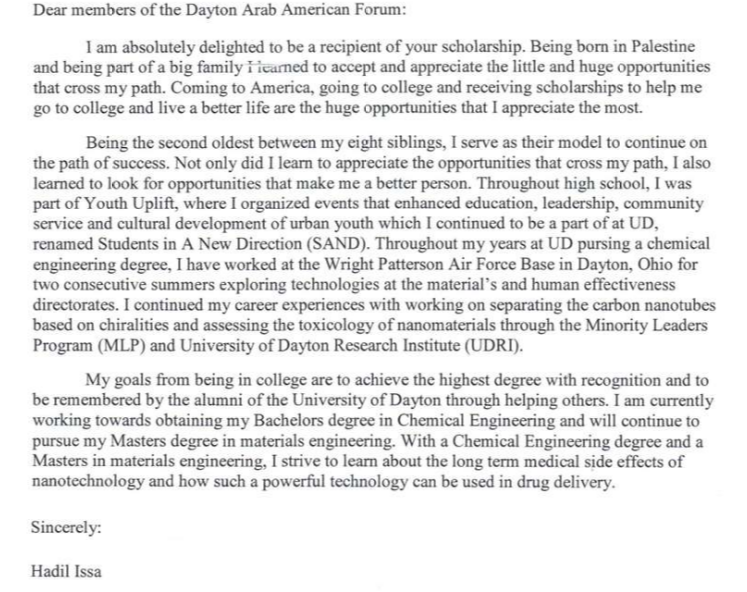 I greatly appreciate The Dayton Arab American Forum Endowed Scholarship, and plan on using all my opportunities to excel at the University of Dayton. I moved to Ohio two years ago and for the first time I truly feel welcomed as an Arab American student at UD. My Mom always told me to look into Arab American scholarships, and I told her I doubted there were any available. I felt blessed when I was proven wrong in my assumption. It really brings warmth and joy to my life knowing there are people who really care about students from all cultural and ethnic backgrounds, and for once, I feel included in a community of support. As the newest member of DAAF, I would like to thank you all for your kindness.